Free PHP help desk / customer support software, fast customer support software. 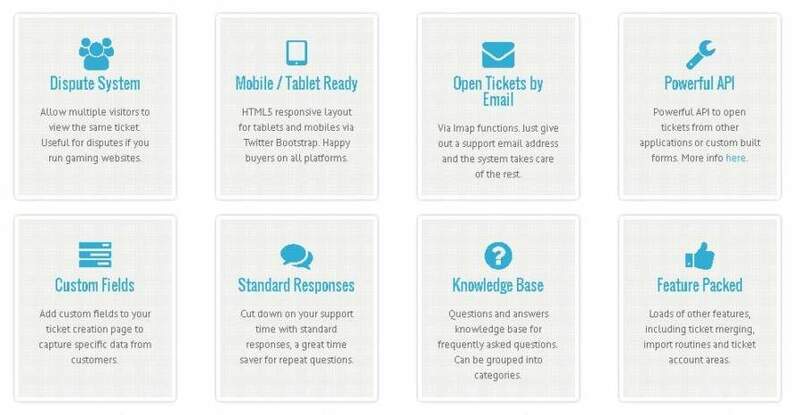 Self hosted free ticketing system. Free helpdesk software. Maian Support starts from ₤39.95 ($52.28). All Maian Support reviews are manually approved and verified. Wow I have never seen a better support team and so quick! If you have literally ANY question or something – they are gonna answer it right away without no ego or stupid attitude towards you, really love those guys and I’m looking forward to any new products these guys create. 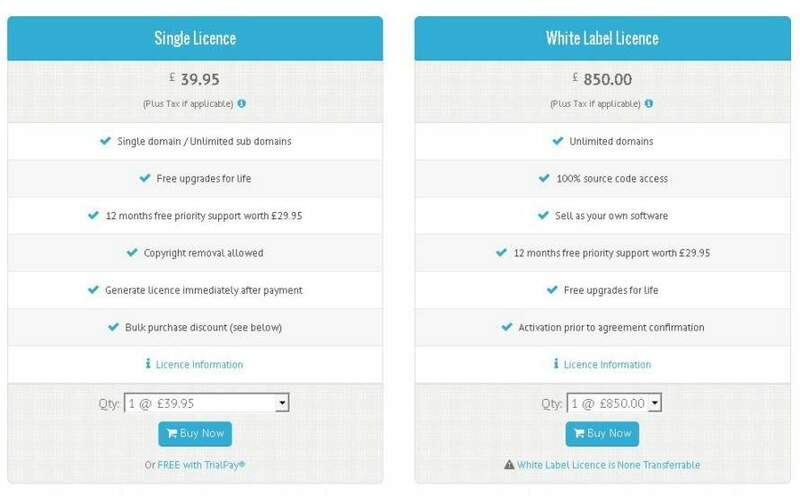 Hey guys, in my most sincere and honest opinion the £ 39.95 you spend on this product is well worth it… I mean if you don’t want to take my word for it just try the free trial first and see for yourself. I would firstly like to thank these guys on the time and effort they spent on this product. I think it is awesome. This is going to work out great for me. I am a big fan of “keep it simple” and “solve the problem, don’t make more.” This system is perfect. Automatic ticket creation from inbound email. Auto account creation. Auto everything. Thanks again for building this great product. The mobile interface is great too! As a business owner who needs to provide a decent level of support to my customers and visitors I have been on the look for a fantastic support system that is suitable for the needs of my website. There is not many systems today that allow customers to email you and it automatically opens a ticket for them, just like this system does. 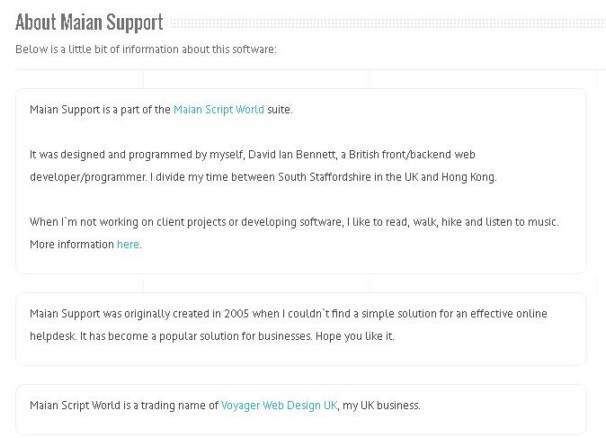 I would and am recommending the Maian Support System to anyone needing to provide services on their website. The support is also fantastic and is always replied to in a speedy and polite manner. I am in no way linked in with the owner or this Support System software. I am providing 100% genuine feedback. I really love this support script in terms of its simplicity, ease of use, and features. Thanks for developing a fantastic product that has great value for money. This one is so simple and does everything needed to run my business online. Just downloaded the free support ticket program and have immediately bought the paid version. This program is simple to install and fantastic to use. Just wanted to say thank you to you. I had previously tried a few other programs which I ended up throwing away as being too complicated or a drastic overkill. I am a complete newbie to php ticket support applications….it is not part of my job and I am not even a programmer. So when my partners told me to get a ticket support system up and running, with a “just make it happen” attitude, I was a bit overwhelmed. Lucky for me I stumbled onto Maian Support. I do not know if Maian is a good support system or not, it does not really matter. What I do know is that these guys offer the best support and services I have ever received. I have asked them endless questions (some of them really stupid) and they never jusy give up… their patience is endless. For me, support team are just a guys who really do give you “a helping hand” when you need it. Kudos to you Maian Support, you deserve it! I want you to know that this is what I have been looking for over the past year … the strongest value, right now, is that the app has functionality to connect particular fields to one or more departments. Excellent! I am so thankful for prompt response I get each time from these guys, makes me feel even better about deciding on this help desk. Thank you so very much for the best helpdesk program available. The responsive design is the main reason I chose this one, and loving the simplicity of working it. This support script has been a complete life saver for me, handling 100’s of tickets in a completely professional way. 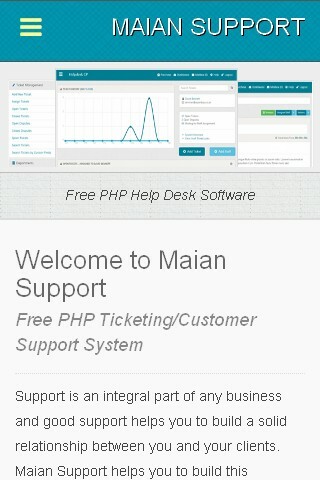 I chose Maian Support for its clean and responsive UI. It was a snap to install and the priority support is excellent. I have been developing web sites since the 90s. I have several of Maian Support scripts and decided it’s time to send you a testimonial which I feel all of you rightly deserve. Like all the other scripts that I have the pleasure of owning and using, this support script is the same quality as other top notch scripts, right from the same ease of installation, the same intuitive design, right up to the same ease of use, and they keep them updated, they certainly have a talent for this. I have so many other scripts from other programmers that are all so often missing features, never updated, etc., so I urge these guys to keep up this great work. I’m very happy after testing that we will have such a fine system to serve some of our communication needs. Very well thought out and effective system. Being direct here in this Maian Support review… we are absolutely appeased, truth be told there are truly admirable admins keeping this particular firm and awfully highly affordable price -> £39.95 single purchase! 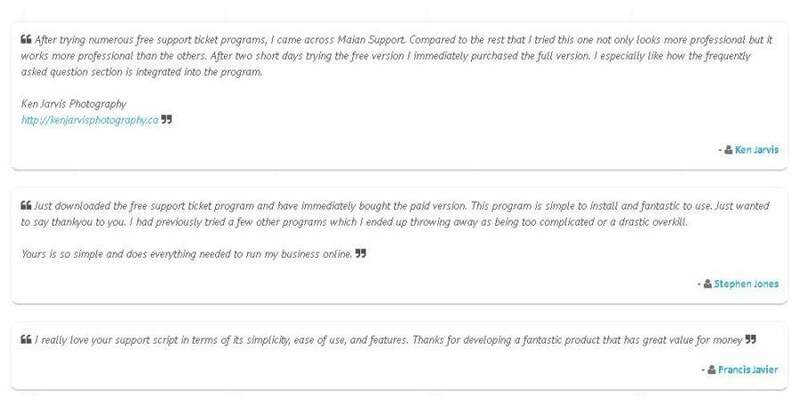 We bought Maian Support through maian script and I received 2 months cash back guarantee.. I will instead opt for AlstraSoft E-Friends than maian support. I had some problems with this firm in the previous, so please discover something far better. The most ideal alternative amongst content management systems . No Maian Support questions were found. Please submit your first question. Maian Support utilizes Maian Script network to handle payments. 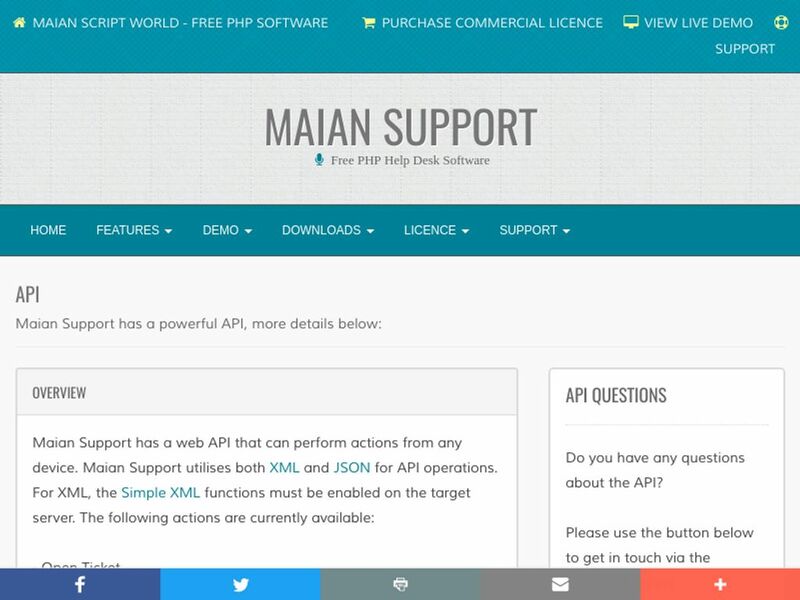 Do you want to build with Maian Support? 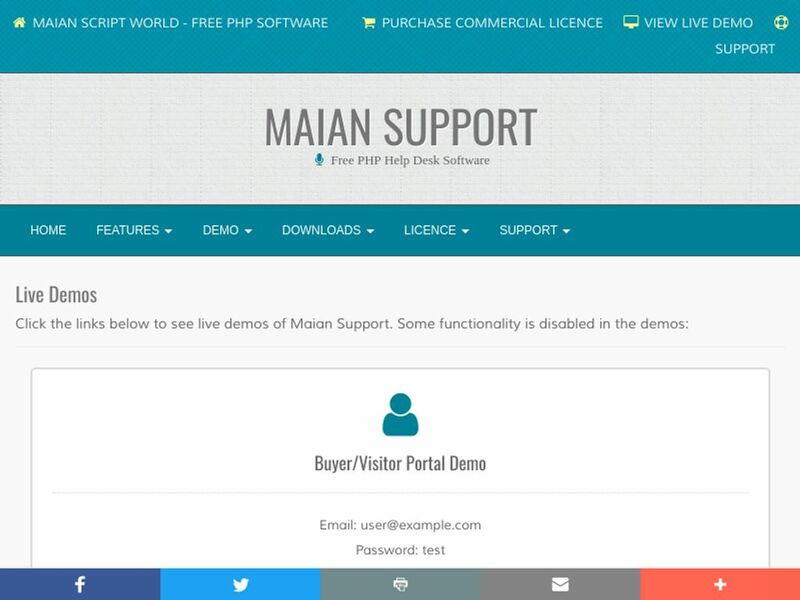 Visit Maian Support developer platform for more information. 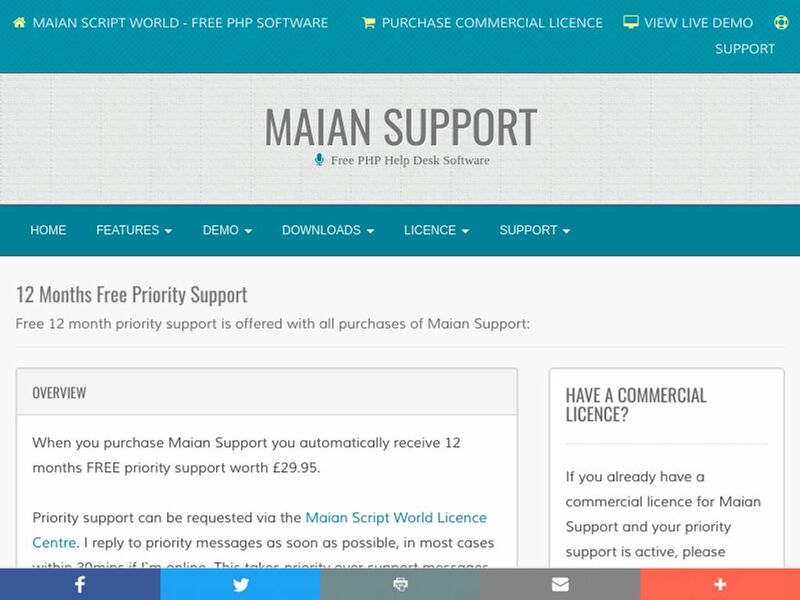 Do you want help with Maian Support? Any trouble with Maian Support review? More Content Management Systems Looking for alternative to Maian Support ?